This month has given me a great opportunity to try flavors and cuisines that I’m not very familiar with. 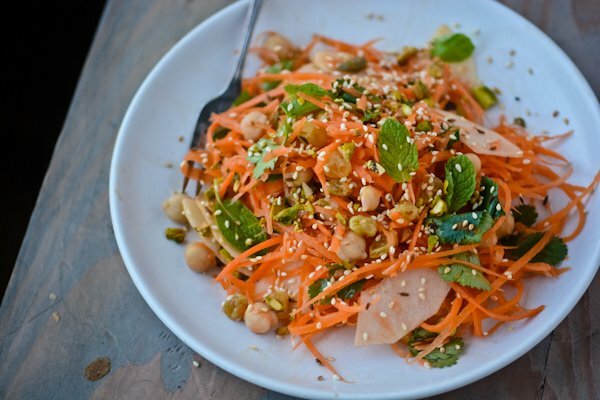 This indian-spiced carrot salad utilizes cumin and sesame seeds for it’s amazing flavor. I can’t vouch for it’s authenticity since I combined flavors that I like and came up with a salad that I love to eat. The garbanzo beans make it a little more substantial and I added the apple for sweetness and crunch. 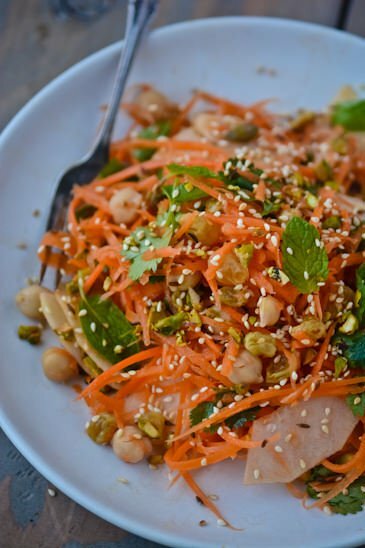 You could add some roasted chicken or shrimp if you would prefer a non-vegan version or some grilled halloumi cheese would also be a good option. I stuffed some into a pita for a quick portable lunch. 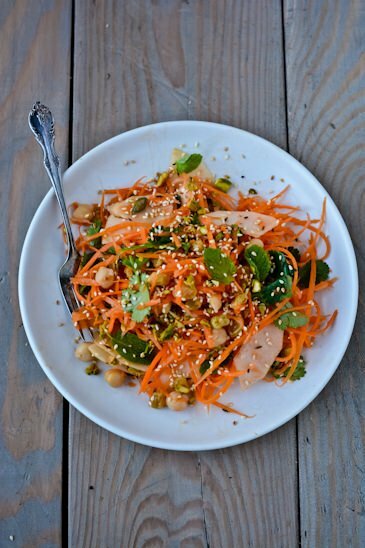 This indian inspired salad features crunchy carrots, sweet apples and creamy garbanzo beans and lots of fresh herbs. 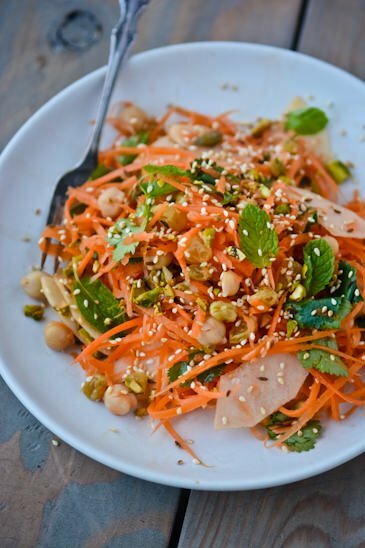 You can make this a warm salad with the addition of some grilled chicken or shrimp. Place the raisins in a small bowl and cover with boiling water. Let the raisins plump for 20 minutes or so until the raisins are soft. Toast the cumin and sesame seeds in a small skillet over medium heat for 5 minutes or until the seeds start to turn golden brown and are fragrant. 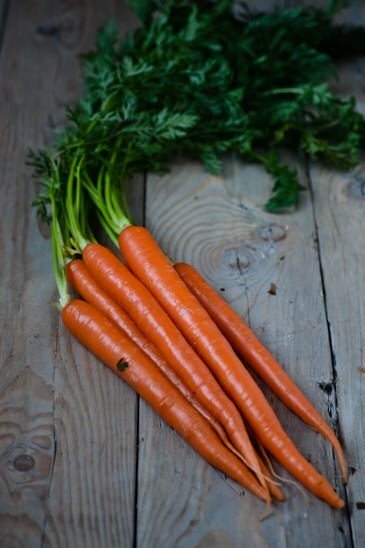 Finely grate the carrots and place them in a large bowl. 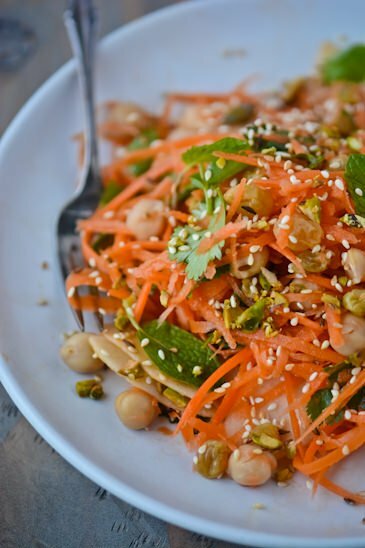 Core the apple, finely slice and add them to the carrots along with the garbanzo beans. In a small bowl combine the sherry vinegar, lime juice and olive oil. 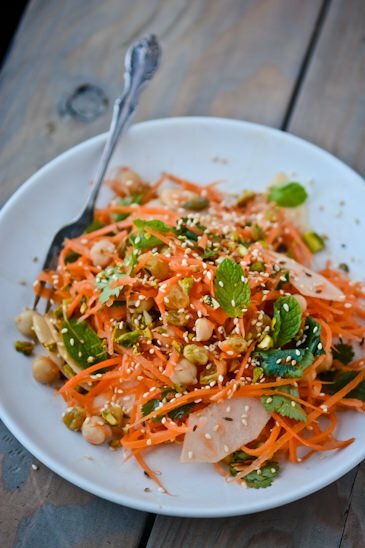 Pour the dressing over the carrots, add the parsley, mint and ¾ of the sesame-cumin mixture. To serve sprinkle with the pistachios and the remaining sesames and cumin seeds. What a yummy salad!!! Thanks!! Thanks for trying the recipe! I’m so glad you liked it. It was a whole new flavor profile for me and I wasn’t sure at first if it was going to be successful but once I tasted it I couldn’t wait to make it again! I’m so glad you liked it. I wasn’t too sure about that when I put it together but I was so pleased when I tasted it. Definitely a different flavor profile for me!